Orphans of the conflict in Kashmir, 14-year-old Shahana and her 9-year-old brother Tanveer have lost both parents, their older brother and their grandfather in recent years. Shahana works hard embroidering garments for a local merchant to earn money to support herself and Tanveer in their grandfather’s hut in the mountains. The fragile safety of their life is further threatened when Shahana and Tanveer find a young man unconscious by the river close to the Line of Control (LoC). Zahid is from the other side of the LoC and sheltering him will put all of their lives at terrible risk, but can Shahana hand him over to the authorities when she knows this will mean almost certain imprisonment – or worse – for Zahid? Before reading Shahana, I had very little awareness of the conflict in Kashmir and was astounded to learn (via the information pages at the back of the book) that this conflict has been ongoing since partition of the India subcontinent in 1947. After reading the book, I still didn’t have a clear knowledge of the ins and outs of the conflict, but rather an awareness that while politicians and men in authority struggled against each other to gain control, families are torn apart with women and children left defenceless and abandoned by those who should be working to protect the weak and vulnerable. As Shahana tells her story, it is impossible not to feel outrage that so many young children face physical danger, starvation, early marriage, forced labour or difficulty accessing food, water and medications. I am a big advocate for the use of fiction to raise important issues with children. 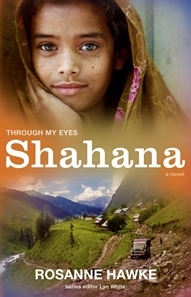 Shahana gives Australian tween and teen readers a wonderful relatable character to help them gain insight into the challenges faced by children their own age around the world; children struggling to live in an environment where they deal with constant physical danger yet courageously hold on to a sense of hope, family and an appreciation for their culture and community. There are currently six titles planned for the Through My Eyes series, written by different authors and published periodically between now and March 2015. The fiction series aims to raise awareness of the fragile lives of children in modern conflict zones. Rosanne Hawke has offered an inspiring start with Shahana and I plan to make sure my children have access to all of the titles as they become available. You can find out more about the series at the Through My Eyes website, which has a summary for each book, background information about the authors and teacher’s notes to support the use of Through My Eyes books in Years 5 – 8 classrooms. A portion of the proceeds (up to $5000) from sales of this series will be donated to UNICEF.